April 9 is Sine Die, the final day of the 2018 Legislative Session in Annapolis. As many predicted, this year’s session has been a whirlwind of legislative activity – one that highlighted the importance of the monumental challenges we face heading into the upcoming primary and general elections. From automatic voter registration, which will add Maryland residents to the voting rolls upon receiving a driver’s license, utilizing a social services agency, or buying insurance on the health exchange to requiring Paid Sick Leave for hourly workers, this session has shown why there is a need for bold, progressive leadership throughout the state legislature. Last week, I penned an op-ed for BMoreNews explaining exactly why I think it is necessary for the 45th District to have new representation in the State Senate. You can read the full article here. By the way, if you want to learn a little bit more about who I am and why I’m running, please check out our official campaign video. The primary election will take place on June 26, with early voting taking place from June 14 through June 21. A great way to show your support before polls open is to display a lawn sign in your front yard. If you haven’t gotten yours yet, please fill out a request form here. In other campaign news, we are proud and humbled to have earned the endorsement of LiUNA! (the Laborers’ International Union of North America). 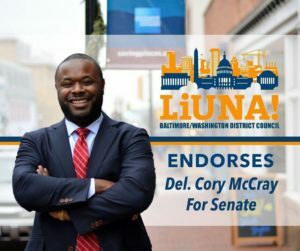 Standing up for working class families has been a core element of my platform since my House of Delegates campaign and I am confident that with LiUNA’s support, we will be able to pursue this policy agenda with even more vigor in the Senate. 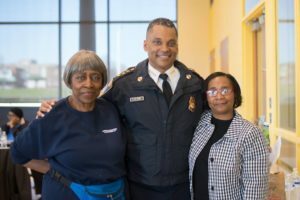 This year’s final “Conversation with Cory” featured Daryl De Sousa, Baltimore City’s Police Commissioner. Thank you to all who came out and participated in the discussion with the Commissioner. We’re proud to have facilitated an opportunity for residents of the 45th District to talk directly with law enforcement leadership. As you know, an ongoing legislative priority of mine has been to enact policies that expand apprenticeship programs throughout the state. We were recently highlighted by CNA, a nonprofit organization with national reach, our work to make apprenticeship programs more accessible. You can read the full article here. Finally, scholarship applications for new and continuing college students who live in the 45th District are ALMOST DUE. The application must be submitted no later than April 13 and can be found here.